What are the Dwarf Planets? What is a dwarf planet, and what makes it different from an ordinary planet? A 3D illustration of dwarf planets and stars. Dwarf planets are very similar to regular planets but they are neither planets nor natural satellites. Just like regular planets, dwarf planets have sufficient mass and gravity to make them almost round which allows them to travel through space in an orbit around the sun. However, their paths around the sun are characterized by other objects like asteroids and comets. 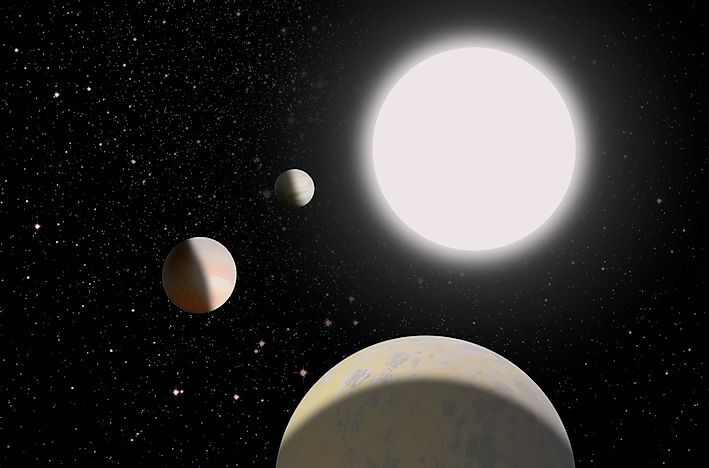 The term “dwarf planet” was adopted in 2006 as a way of categorizing bodies orbiting the sun as a result of the discovery of other objects that are further away from the sun than the planet Neptune. There are dozens of dwarf planets in the solar system. However, only five have been recognized through direct observation. Ceres is the largest and most unique object occupying the asteroid belt. It is resident between Jupiter and Mars and is the closest to the Earth. Ceres was the first of the five dwarf planets to be visited by a spacecraft. With a diameter of approximately 587 miles, Ceres is the largest of the minor planets and the 33rd largest known object in the solar system. It contains rocks and ice and is estimated to compose 30% of the mass of an asteroid belt. Ceres’ surface has a mixture of ice, water, and minerals including clay and carbonate. Pluto is probably the most famous of the five dwarf planets. It was long classified as the ninth planet in the solar system. It orbits the sun in the Kuiper belt and was the first Kuiper belt object to be discovered. It is the second-largest of the five dwarf planets and the 9th largest known object directly orbiting the Sun. Pluto has five moons and is about 7.4 million kilometers from the sun. Its diameter is 2,380 kilometers while its mass is about 0.22% that of Earth. Pluto contains several gases including Nitrogen, Methane, and Carbon monoxide. Haumea is situated beyond Neptune. Discovered in 2004, it was given the name of the Hawaiian goddess of childbirth known as Haumea. Its mass is about 30% that of Pluto and 0.07% that of Earth. Its shape has not directly been observed, while its gravity makes it possible to relax into hydrostatic equilibrium. Its high density and rapid rotation are thought to be as a result of a giant collision making it the largest member of the collisional family. The presence of collisional family may suggest that Haumea might have originated in the scattered disc. It displays a fluctuation in brightness over a period of 3.9 hours, faster than any other body in the Solar System. Makemake is the largest Kuiper belt object in the classical population. Its diameter is approximately 60% that of Pluto. It has its own satellite and an extremely low temperature. Its surface is covered with ice in the form of methane, ethane, and nitrogen. Makemake was discovered in 2005 and was initially known as 2005 FY9. It was not recognized as a dwarf planet until 2008. It follows an orbit similar to that of Haumea. Makemake is farther from the sun and has an orbital period of 310 years. It is currently the second-brightest Kuiper object, bright enough to be detected by a high-end telescope. Eris is the most massive and the second-largest of the five dwarf planets. It is also among top ten massive bodies orbiting the sun. Although Eris is massive in size, it has never been visited by a spacecraft. It is classified as a plutoid and has an orbital period of 558 years. Its orbit is highly eccentric bringing it to about 37.9 AU from the sun. Eris measures 2,397 kilometers in diameter making it almost the same size with Pluto. Its observation reveals the presence of methane ice indicating some similarities with Pluto. Its temperature is extremely low compared to that of Pluto but sometimes it approaches the sun close enough to melt some of its ices. Do All the Planets Ever Line Up? How Many Types Of Planets Are There?